When you see your smile in the mirror or in a photograph, we want what you see to make you happy. For too many people, that’s not the case. Sometimes, however, improving that smile isn’t really all that difficult! Of all the cosmetic dentistry treatments available from Ann Arbor cosmetic dentist Dr. James Olsen, teeth whitening is certainly the most popular, the most convenient, and the most affordable. Moreover, the results can be dramatic. With all of these obstacles, no matter how hard you try, your teeth will inevitably discolor over time. As time goes on, not only do most of us eat and drink dark foods and beverages, but our enamel wears down, making the teeth more susceptible to staining. This may be why teeth whitening continues to be one of the most popular cosmetic dentistry procedures. Dr. Olsen offers two take-home teeth whitening kits, allowing you to get whiter, brighter teeth in a way that best fits your schedule. 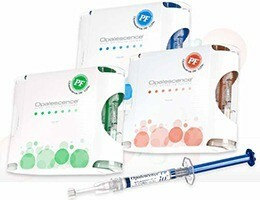 Opalescence is designed to remove both the extrinsic stains on your teeth—those that are on the surface—as well as intrinsic, those that hide in cracks in tooth enamel as well as those that are just below the enamel in the dentin. Opalescence whitening gel contains either carbamide peroxide or hydrogen peroxide, both of which are powerful whitening agents that sends oxygen molecules deep into your teeth to break apart stains and whiten teeth. Dr. Olsen will custom-make trays for you to take home and fill with the Opalescence gel. Wear them for the amount of time Dr. Olsen prescribes, and you’ll see a whiter and brighter smile within two weeks. Moreover, you don’t need to worry about sensitive teeth after whitening because Opalescence contains potassium nitrate and fluoride to help reduce sensitivity. 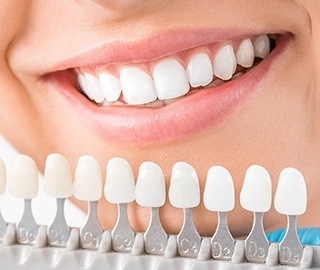 With this system, you will also be given custom fitted whitening trays that we make in the office. Venus White Pro is available in three strengths; you and Dr. Olsen will determine which one is best for your teeth. Choose anytime day or night to wear your whitening gel and trays. Venus White Pro gel contains potassium nitrate, which helps guard against the tooth sensitivity that can happen with other whitening systems.